The latest generation of the award-winning Soprano laser hair removal system, Soprano ICE is used by advanced hair removal clinics and leading physicians around the world. 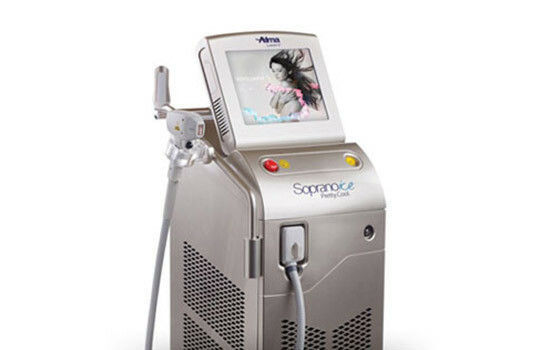 The Soprano ICE platform represents a new era in laser hair removal technology and treatment methods. By incorporating multiple laser wavelengths and technologies, Soprano ICE allows you to treat the widest range of patients and hair types quickly and painlessly, all year round. Soprano ICE is the most complete and effective laser hair removal solution available today. By incorporating multiple laser wavelengths and technologies, Soprano ICE allows practitioners to treat the widest range of patients and hair types all year round, administer treatments quickly and comfortably and achieve the best possible clinical results. Always at the forefront of innovation, Alma brings you the most advanced hair removal solutions available in the industry. By combining the benefits of the Alexandrite wavelength with the advantages of a diode laser, Soprano ICE offers the cutting-edge in hair removal technology and treatment methods. ICETM TECHNOLOGY Simultaneous contact cooling ICETM is an advanced cooling technology that cools the skin during treatment for longer periods of time. The ICETM tech cold sapphire tip minimizes the risk of burns on the skin surface while maintaining heat within the dermis where hair follicles are treated. 1.Analyzing the skin and hair condition of the damage along with skin oil, normal, dry, dark and so on skin and hair types. 2.It will be very convenient for a beautician to carry it. 3.The result is accurate by high definition camera which is specialized in the analysis of skin or hair quality, oil and moisture, and nutrition, then beautician can take the right treatment to care the skin or hair according to the result of before and after! 2. The live image motivates clients to act on problem areas 3. Most affordable and simple model perfect for any hair care professional 4. Results of hair care treatments can be easily reviewed over multiple client visits to ensure effectiveness or alter treatment.